Going back to Spokane for the Bike Swap means seeing lots and lots of friends, reminding me of the ways in which bicycling has brought me some new friends and added layers and richness to existing friendships. 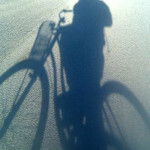 Bicycling gives you entree to all levels of activity and the chance to make friends. If you’re competitive the racing world provides structure and challenge. As soon as we moved to Seattle my husband started scouting race teams. If you’re new in any town with a bike club their calendar of rides gives you a way to find people who share your interest. During a major group riding event like the Jederman Gran Fondo in Cheney or the Ann Weatherill Classic in Walla Walla you might find your pace matches someone else’s and you talk for miles. 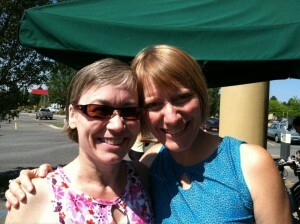 Betsy Lawrence (left) and Barb Chamberlain, founders of Spokane’s Belles and Baskets informal women’s riding group. And then there’s adding bicycling into an existing friendship. When I started Bike to Work Spokane, my friend Betsy Lawrence (always good for yoga and coffee) got roped into helping with the wrap-up party our first year, 2008. 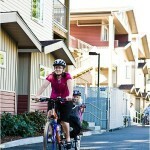 From there she resolved to expand her recreational riding into bike commuting. The rest, as they say, is history. One night she emailed me saying, “We need a women’s bike group to help other women like me who don’t think they can do it!” 20 minutes later she had created the Yahoo email account and a Facebook page for Belles and Baskets to help women get rolling in a supportive group with a heavy emphasis on treats. Betsy’s launch of Belles and Baskets introduced me to Wilma Flanagan and I recruited her for a seat on the Spokane Bicycle Advisory Board. The group introduced me to bike travel writer Katherine Widing, who ended up developing the Pedaling the Palouse tour and working on the San Juan Islands chapter for our new bike tour book, Cycling Sojourner Washington. So many great friends I can’t list them all here. Back to today’s Bike Swap: I rode my bike there in the sunshine knowing I’d see lots of friends, and I wasn’t disappointed. People stopped by our Washington Bikes booth and when I finally got to wander around a bit (4 hours into the day because it was crazy-busy) I couldn’t go two feet without seeing someone who has become a friend thanks to bicycling. Tomorrow I’ll be on a Belles ride for another friend fix. The Spokane Bike Swap gets bigger every year, bringing together more and more people who may end up becoming friends through a common love of bicycling. Other events and groups do the same all over the state. As one example, Velofemmes in Tacoma, a women’s informal bicycling group formed in 2013, reminds me of Belles and Baskets and I’ll be riding with them one of these days. I bet I’ll make some new friends. Bikes: The playground for adults. 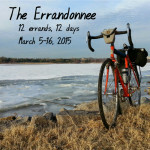 How has bicycling created and enriched your friendships as an adult? This article was posted in Attitudes, Encouragement, Events, Women. Bookmark the permalink. Follow comments with the RSS feed for this post. Both comments and trackbacks are closed.